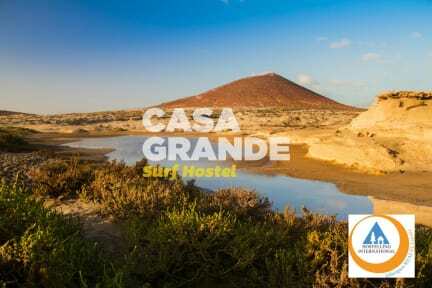 Casa Grande Surf Hostel associated to Hostelling International, is the ideal place to get to know the island of Tenerife. We are located on the seashore of El Medano, a coastal village only 5 minutes from Tenerife South airport, with sunny weather all year round and a pleasant and relaxing atmosphere, with beautiful walks along the coast and open-air seafront bars to enjoy a drink. In addition to accommodation, we offer our guests free use bikes and sports and beach equipment, surf and sea sport services, equipment rental, board storage, windsurf and kite surf lessons and shop. There are also other activities such as outings, hikes, language lessons, barbeque's, etc. Really cool place to stay. The staff is very friendly and helpful. The atmosphere is awesome. 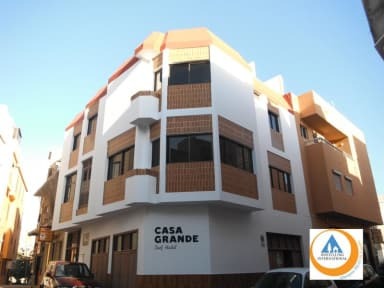 This is by far my most favorite hostel on Tenerife. I would give 100 points for atmosphere if it would be possible. I enjoyed my stay, it's a really cool place. Best location and staff ever. Always helpful and friendly. If you want to meet fun people then this is the place, fun day tours and nights out plus a free dinner every night. Everyone is nice. I met the love of my life here too. She is really sweet and nice. It wouldn't have happened if I hadn't come here(Ryan, thank you!) We are already planning to come back here for our honeymoon. Wonderful staff, helpful and kind . It's a great atmosphere and full of interesting people. It may not have a Michelin star but evening meals are both delicious and lively cooked with love ! Stayed for a few nights. Hostel is in great location. Good amenities and clean facilities. The staff that volunteer and stay there were all friendly. The communal dinners were great way of meeting everyone. Would definitely come back. I had an amazing time here and would recommend it to anyone wanting to visit Tenerife away from the main hustle and bustle. The hostel is great and I met the best people staying here. Lots of restaurants bars and cafes around. It was a perfect place to stay after a day of adventures and super close to the airport. Fantastic place, full of amazing people. Staff is super helpful and friendly. Great value for money, super location (literally 2 minutes walk from the beach). Pablo's dinners are amazing and good value for money. Plenty of room to socialise and meet other people. This hostel has got everything the travellers need. The staff was incredibly friendly and accommodating, loved the food they made for dinner every night! Had an excellent stay here. The location is ideal for going to the beach and walking around this cute little town. I would stay here again in a heartbeat. The staff was incredibly kind and helpful.